Frederick Law Olmsted understood nature’s ability to rejuvenate the mind and body. One of the principal designers of Central Park in New York, he took pains to replicate the gentle beauty he saw in European parks that blended trees and shrubs, streams and bridges. “The park throughout is a single work of art,” he wrote. That pastoral artistry can be fleeting in a large metropolis. The relationship between humans and nature improves mental health and promotes prosocial behavior. But as cities grow, green space is squeezed out. Community leaders are finding ways to restore some of the balance. The opening of the High Line in Manhattan in 2009 brought national attention to the idea of reclaiming underused space for parks. Its success led to the development of a network of projects across the country, including an elevated park in Philadelphia, a deck spanning a freeway in Dallas and a multiuse trail around downtown Atlanta. An elevated viaduct a quarter-mile long, the first section of the Rail Park in Philadelphia offers a peek of what’s planned. The project will eventually transform three miles of rail lines used by the now-defunct Reading Railroad. Visitors can relax on large wooden platforms and bench swings. The pathway meanders through an area once home to shuttered factories; eventually, it will connect 10 neighborhoods in the city. 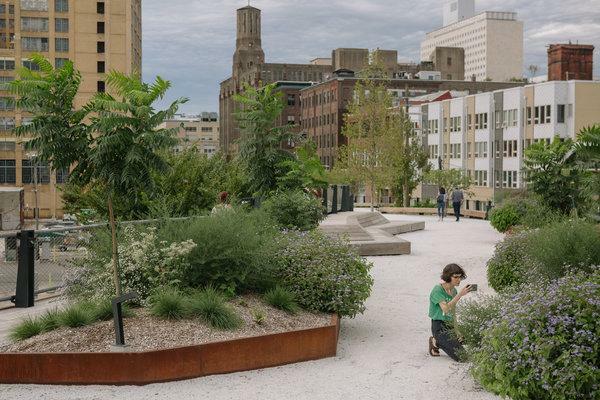 The Rail Park is part of the High Line Network, a collaborative group of 19 reclamation projects across North America that was announced in 2017 after the success of the High Line. Project organizers share information to help communities transform obsolete infrastructure into public parks. Klyde Warren Park opened in downtown Dallas in October 2012 as a deck over a recessed portion of the Woodall Rodgers Freeway, and it has drawn more than six million visitors since. The park has created more than $2 billion in economic development, according to the foundation that runs it, and has increased property values in the area. The foundation recently announced a $76 million expansion that will add 1.2 acres and include a 20,000-square-foot pavilion with a visitor center. Designed by Jim Burnett, the 5.2-acre park features free daily activities like yoga, live music and a “standing” tour of the surrounding skyline. Popular areas include a children’s park with water jets and interactive fountains, the Imagination Playground, and a reading and games room. Conceived as a master’s thesis by a student at Georgia Tech, the Atlanta BeltLine has expanded into a program of sustainable transportation, land use and green space. The project will redevelop the rail corridor that encircles the city and is expected be completed in 2030. The BeltLine is also part of the High Line Network, which includes projects in Detroit, Miami, San Francisco and Toronto. The east side of the BeltLine connects to Ponce City Market, a mixed-use development in a renovated Sears building in Atlanta’s Old Fourth Ward neighborhood. The BeltLine, which draws two million visitors each year, will eventually connect 45 neighborhoods via 33 miles of trails and 2,000 acres of parks.